Aside from letting you run Windows and OS X apps side-by-side, the latest version of Parallels has a cool migration wizard that copies Windows programs and files to the new Mac via a USB cable linking the two machines. That's pretty slick if it really means you don't have to install your favorite Windows programs all over again. 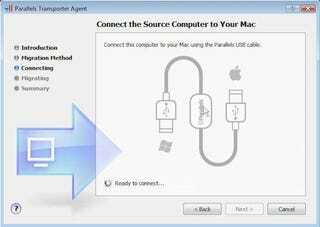 It also looks a lot easier to use than VMWare's converter tool. So the $100 Switch Edition is clearly aimed at newbies: good to throw-in if you're buying a Mac for a long-time Windows user. They're the ones who may benefit from the included two hours of flash-based Mac tutorials.